We Can Quickly Troubleshoot And Repair It. Call Us Today! The garage door opener has two distinct roles. It controls the system's operation, deciding when it needs to open or close, and it also produces the pulling or releasing action that's required to start the desired action. Therefore, it is incredibly important, and when some piece of it malfunctions, using your door automatically may be impossible. When faced with any type of opener-related problem, there is one local company who you should call. Can you guess who? Because moving parts of your door system are bound to wear out over time, your opener motor is more than likely to require repairs eventually. If you find that it starts making empty droning sounds but can't seem to be moving the door, more than likely, the motor gear will need to be replaced. 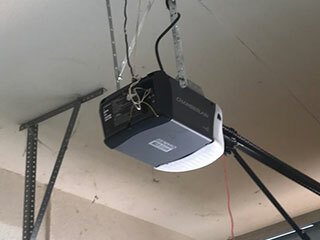 Because garage door openers use both mechanical and electrical components, the variety of problems they can experience is quite extensive. Logic board problems have been known to cause these units to behave erratically, or to fail to start at all. The photo electric eye sensors are another potential area where issues can manifest, as they can be knocked out of alignment and may even become scratched or damaged, and will fail to work properly. The type of drive system an opener uses will determine what sort of problems it can experience and how much maintenance it will require. For example, a chain drive unit will need adjustment and lubrication to stay in functional form. Screw drive units consist of fewer moving parts, and therefore, beside lubrication, don't really need much maintenance. The belt of a belt drive unit can tear and may require replacement or adjustment as well. Regardless of which type of unit you have, if your automatic opener is giving you any sort of trouble, don't hesitate to reach out to our team at Garage Door RepairBuckeye. Our professional technicians can fix any problem, and we're always happy to lend a helping hand. Call us today.